This book was originally published in 1876 by U.D. Ward and Sheldon & Company of New York. It was the first book chosen to be published by Backus Books in 1980. John Quincy Adams (1825-1881) was a Baptist pastor in New Jersey and New York. 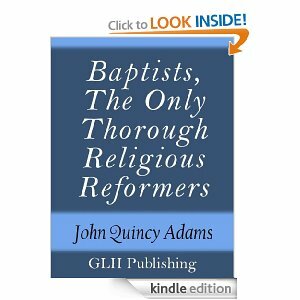 Adams especially defends the ordinance of baptism as an immersion in water. As the title suggests, he believed that the Reformers did not go far enough in their reform of the Church of Rome. The ten chapters (called “lectures”) are aimed at the true believer as a reformer and also preacher of the Word of God. They include reformation, tradition, Christ’s kingdom, rights of conscience, equality of disciples, Biblical translation, and order of primitive churches. It is remarkable to see the issues that Baptists faced in the nineteenth century and how we continue to face many of the same issues.